The controversial Los Angeles emcee has passed away. 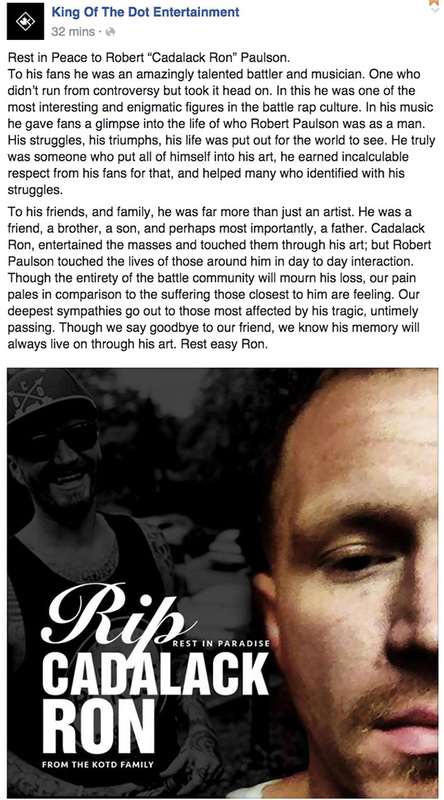 Battle rapper and musician Robert "Cadalack Ron” Paulson has died, according to sources close to him. 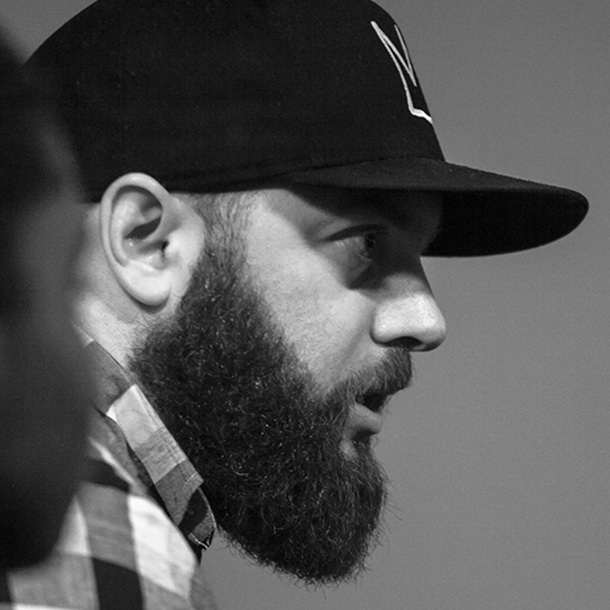 The self-proclaimed "King Of The Mid Tier" first rose to prominence as a battle rapper in the golden era of Grind Time West, facing opponents such as Caustic, QP, The Deadman and Real Deal. 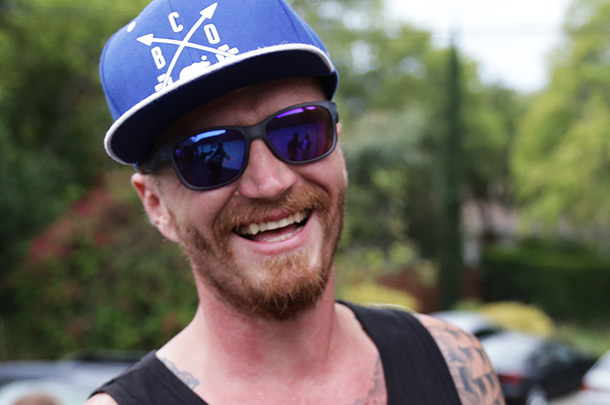 He was also an accomplished freestyler, winning a Red Bull tournament by beating Dizaster in the finals (while on acid, as legend has it). The controversial Los Angeles emcee was always pushing the extremes of what could be said and done in battle rap, and his mission in the ring often seemed to be to make others uncomfortable. Still, he was hugely appreciated by those who saw him as a unique talent and respected by his peers from all walks of life. Anyone who spent time with him — or watched his interviews or listened to his music — knew that he was incredibly self-aware, and that his battle content was often as subversive as it was shocking. With a brash style that never held back, Ron used battle rap as a conduit for performance art akin to controversial punk rock icon GG Allin, a figure he identified with (and whose initials were his first of many tattoos). Throughout his career, he mastered the art of irreverence and detachment from the ugly things he forced us to confront, and he was frequently hilarious in doing so. Check his many appearances on The Dirtbag Dan Show for recent examples. 3.0 made his battle debut against Sicarii at KOTD's "Back To Basics 2" and with renewed focus and energy delivered a performance that absolutely overwhelmed his opponent and had many fans excited about his next move. A few months later on Halloween at the costume-themed "Virus" event, Ron was asked to perform as a KKK member to battle Daylyt, who was dressed as Malcolm X. It was the visual embodiment of the racist sentiments many fans had come to associate with him as a battler because of the over-the-top lines he used against opponents. Ron stated in interviews that he planned on using the platform to repudiate those claims. He explained that his third round was going to be a condemnation of the racism that he had become so associated with, but the battle fell apart before he was able to deliver his message of positivity. Ron spoke about his life and background in an in-depth interview on the Kinda Neat podcast in 2013. It's a fascinating interview that sheds a lot of light on who he was. Listen to it here. BattleRap.com sends condolences to his family, friends and fans. With files from Jackson Yates and Brad Danyluk.